On April 5, the Falvey Memorial Library Staff Council hosted the 14th annual student recognition party as a way of expressing appreciation for the excellent and important work student employees perform. Eleven graduating students received a Certificate of Appreciation signed by University Librarian Joe Lucia, along with a Villanova University alumni license plate holder: Eric Adams, Access Services; Kara Arnold, Access Services; Sean Dunn, Special & Digital Collections; Lauren Fiori, Access Services; Rakhi Devkisan Gagrani, Systems/Technology Management; Daniel Love, Access Services; Eric Maleczkowicz, Academic Integration; Craig McAllister, Access Services; Michael Murray, Programming & Outreach; Krishna Teja Narla, Systems/Technology Management; and Susanna Seibert, Access Services. Daniel Love won two gift certificates donated by Gullifty’s Pizza Grille & Bar. 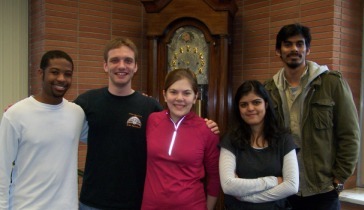 Falvey employs ninety-three students across a variety of departments. Everyone enjoyed the pizza, delicious cookies and the camaraderie. Bill Greene, Access and Information Specialist, served as singing emcee. After the supervisors spoke highly of their student workers, two students, Sean Dunn (Special & Digital Collections) and Krishna Narla (Systems/Technology Management) praised their supervisors, Michael Foight, Special Collections and Digital Library Coordinator; Laura Bang, Special Collections and Digital Library Assistant; and Kathy O’Connor, Systems Librarian.